This article presents an analysis of three dining-related assemblages of pottery from Roman Leicester (Ratae Corieltavorum) and compares them to the patterns already established for pottery supply and vessel use derived from other rubbish deposits across the town and its suburbs. Spatial correspondence analysis is then used to map the varying character of these other assemblages, and the emerging pattern is interpreted. 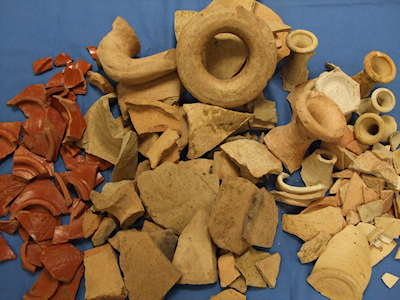 Large-scale excavations in Leicester over three decades have provided a substantial dataset for broader analysis of vessel supply and usage but only rarely do tightly dated groups, relating to specific buildings and food remains, occur. Two of these groups present evidence for 'dining out' during the second century. The first is from the backfill of a cellar, perhaps from below a tavern on Little Lane, containing tablewares, drinking vessels, amphorae, and flagons, alongside animal bones and oysters. The second is the fill of a cess pit (latrine pit) from Castle Street containing amphorae, flagons, tableware bowls and dishes, but no drinking vessels, alongside exotic plant foods, fish and smoked shoulders of beef, which is considered to relate to a 'delicatessen'-style 'take-away'. The third group represents 'eating in' at the later third-century courtyard house on Vine Street and comprises a wide range of animal and plant foods alongside cooking pots, bowls and dishes, and large colour-coated ware beakers, excavated from the kitchen drain and two cess pits. The mapping of data gathered from 26 other assemblages, dating between the mid-first and late second centuries, highlights two spatial trends in vessel deposition across the town. The first is a north-south opposition, with more vessels associated with drinking in the central and northern parts of the town, while the second shows a contrast between the centre, around the forum, where there is a greater proportion of finewares, and the suburbs, where there are larger numbers of jars. Together, these trends suggest that we can identify zonation within Leicester that can be related back to different depositional practices and ultimately patterns of use and consumption.